Colin Kaepernick made a surprise appearance Sunday night in Los Angeles, citing his mission of protest in accepting an advocacy award at an ACLU of Southern California banquet. "We all have an obligation no matter the risk, and regardless of reward, to stand up for our fellow men and women who are being oppressed with the understanding that human rights cannot becompromised," said Kaepernick, who has rarely spoken publicly since opting out of his contract with theSan Francisco 49ersin March to become a free agent. Kaepernick, 30, was on hand to accept the Eason Monroe Courageous Advocate Award to the surprise of a star-studded audience at the organization's annual Bill of Rights Dinner in Beverly Hills. Hector Villagra, the local group's executive director, said at the event that Kaepernick "took a stand knowing he would risk his job." "He has lost his job, one that he loved and was supremely talented and skilled at," Villagra said, according to a Los Angeles Times report citing event organizers. "He took a stand knowing that some would criticize him, and he has been viciously and unfairly criticized. He has been called a traitor because too many people in this country confuse dissent for disloyalty." Kaepernick was named "Citizen of the Year" last month by GQ magazine, which published a feature story detailing his emergence as a polarizing figure in the wake of his national anthem protests.Kaepernick agreed to participate in the photography for the story but did not talk on the record to GQ, which reported he had "grown wise to the power of his silence." Kaepernick, who led San Francisco to consecutive NFC Championship Games and one Super Bowl appearance, remains unsigned. 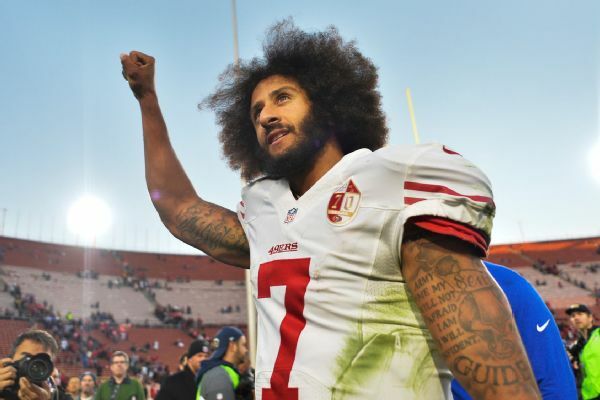 He filed a grievance last month that NFL owners colluded against him because of the protests to raise awareness of police brutality against African-Americans and other issues. Last week, the NFL committed$90 million over the next seven years to social justice causes in a three-segment plan that involves league players. In a memo sent to the 32 teams on Friday and obtained by The Associated Press, the league unveiled what it calls a new and expanded program of community improvement. The new initiative comes in response to the movement started by Kaepernick of player demonstrations staged during the national anthem. The protests include kneeling during the anthem, an act that has drawn steady criticism from President Donald Trump.